Mersen will use its Electric & Hybrid Marine World Expo presence to showcase its newly-developed complete range of DC fuses, hybrid pyro-based protections, and resettable DC power relays. The product line up has been specifically developed to address the increase in both DC voltage and current ratings in hybrid and full-electric, battery-powered marine applications, and are suitable up to 1,500Vdc. 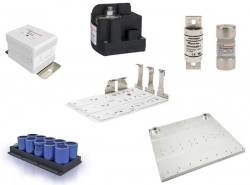 The solutions, which join Mersen’s full range of power management solutions in the field of overcurrent protections, air and water cooling, busbar connections, and power capacitors, and offer a robust and reliable electric protection to manage possible overloads and short circuits, with full coverage of any fault condition management for the safety of both passengers and power equipment.